It is imperative to hold onto bases, because your team earns points over time for each base it controls. Holding bases is also strategically important, because bases provide re-arming and/or repair services to the team controlling them, as well as providing a position from which teammates can join or rejoin the battle. Bases are controlled by presence. To capture an enemy base, you must occupy the space around the designated base waypoint. Upon entering the waypoint space, a countdown timer will appear on your HUD. This timer will only count down as long as you remain within that space. Once the timer reaches zero, that base will be designated as unowned. Repair and re-arm stations at an unowned base will serve either team, but neither team's players may enter the battle at an unowned base, and neither team will earn points for that base. At this time, a new countdown timer will begin. To complete the capture, your team must exclusively occupy the waypoint space until the timer reaches zero, at which point the base is designated as belonging to your team. Your team now has exclusive repair and re-arm privileges, and may (re)enter the battle at that position. You must remain vigilant however, as the enemy may retake the base by the same means. The battle is not won until your enemy is defeated. Holding bases earns you points, but killing the enemy is the only way to take points from them. One points is deducted from a team's score for each ship destroyed. 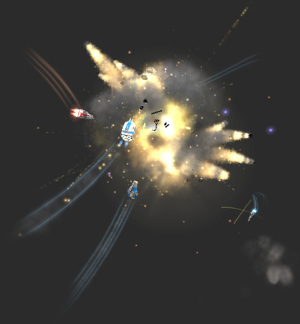 To ensure victory, you must destroy as many enemy ships as possible, while minimizing casualties on your team. In war there are always some whose allegiance is unclear, if they have any at all. In battle you may sometimes encounter players who wear no team colors. These players cannot be trusted. They may take your bases, rendering them unowned. They may attack and kill your teammates, losing your team valuable points. They are a threat. If you see such players, you are authorized to neutralize them at your discretion. You have your orders. Get in there and make your team proud! Remember what you've learned, try to stay cool, keep your wits about you, and have fun!